Consultants' reports describe activities by a consultant or group of consultants related to preparing a technical assistance project. This document dated September 2017 is provided for the ADB project 44141-012. Asia and the Pacific is one of the most biologically and culturally diverse regions on the planet that hosts high numbers of unique animal and plant species and ecosystems. Why are people in Asia and the Pacific particularly vulnerable to climate change? 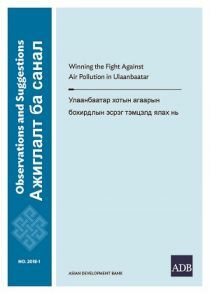 This briefing note draws on successful experiences of other countries to offer practical recommendations for improving the air quality in Ulaanbaatar and other cities in Mongolia. The world urgently needs to restore its degraded forests and landscapes in order to preserve a productive and healthy environment in which humans can flourish. Over 3 billion of the world’s 7.6 billion people are affected by land degradation.